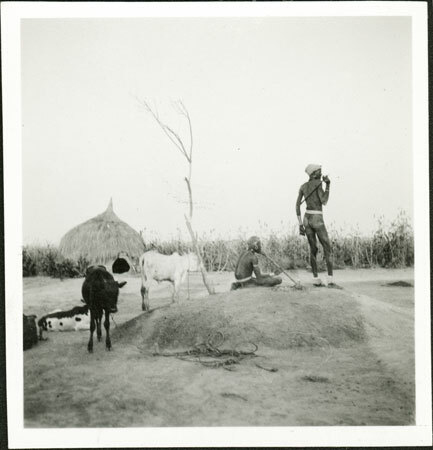 A riek or shrine placed in the centre of a homestead consisting of an earthern mound with a forked branch emerging from the summit, upon which is seated a man smoking a pipe and another standing beside him wearing thiau armbands carrying a stick or club and with mud plastered hair. Near the riek are tethered some cattle, and beyond is a beehive-style hut. The riek post-shrine was considered to be the altar of God within the home, the point of contact between God and spirits (both kwoth) and the lineage or household, and therefore the place of ceremony and sacrifice. Note on print reverse ms pencil - "5 W. Jik." Morton, Chris. "Nuer shrine" Southern Sudan Project (in development). 03 Jan. 2006. Pitt Rivers Museum. <http://southernsudan.prm.ox.ac.uk/details/1998.346.216.2/>.